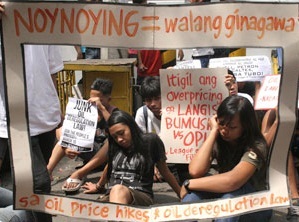 Last March 15, 2012, youth-students who joined the nationwide people's protests against oil deregulation law, oil overpricing and oil-VAT demonstrated how President Benigno “Noynoy” Aquino is reacting to people's problems. 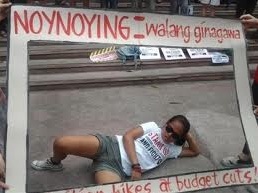 They called this demo as “Noynoying.” Instead of ‘planking,’ they do a little play-acting, or a parody, of “Noynoy” Aquino's inaction on people's pleas against the weekly oil price hikes. 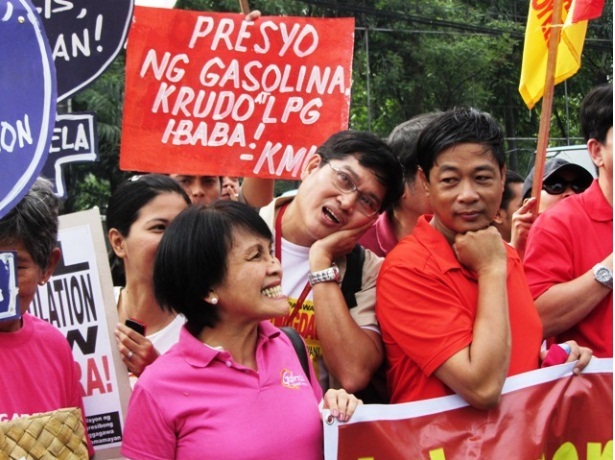 “Guess what he’s doing there,” said Vencer Crisostomo, chairman of Anakbayan and emcee of the program held at the Elliptical road in Quezon City before the protesters drove a caravan to the oil companies’ head offices in Makati. Crisostomo pointed to a participating protester, who was seen lounging at the street, looking bored while chain-smoking. 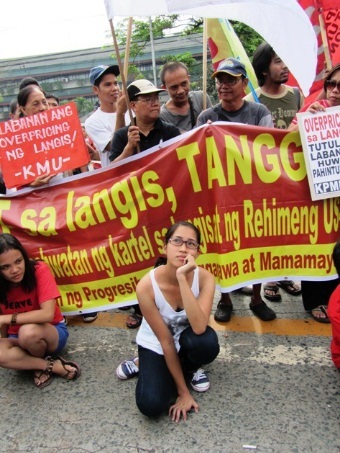 Crisostomo urged the leaders of people's organizations to also do a “Noynoying,” to which COURAGE chairman Ferdie Gaite and KMU chairman Bong Labog cooperated, to loud laughter among protesters, including from Gabriela Rep. Emmi de Jesus. 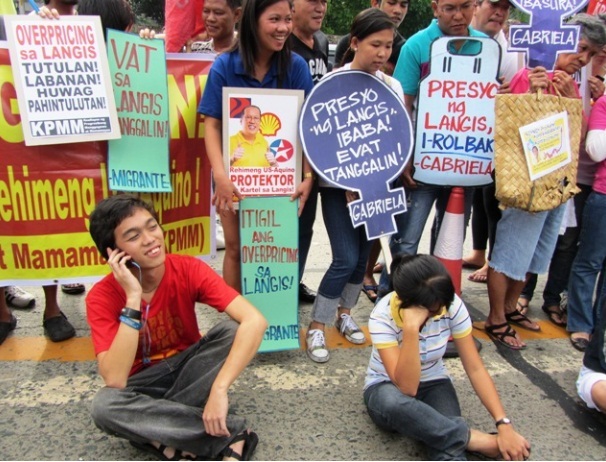 The protesters generally criticized President Aquino for playing deaf and blind, for not acting on the consumers’ issues against the abuses of what they call as foreign oil cartel and for simply pretending like he is doing something when he is just coming out with stop-gap measures such as the derided Pantawid Pasada program. The protesters demand the scrapping or reduction of VAT on oil, and the scrapping or suspension of Oil Deregulation Law. In a democratic country like the PH, everything could not be remedied right away. Well, if this group is trying to have an immediate action of the problem they are working or fighting for, the form of government should be changed to control everything. And then freedom is limited. For the meantime, let us ask ourselves what we've done to our country, rather than ask our country what to do for us. if the government can't do anything but collect taxes, promise change for the better but in reality worsen the lives of the people, then this government should be ousted. In the Phils, what exist is elite democracy, those who are rich and powerful (landlords and businesmen)are the ones in government since time immemorial. The poor majority are given the privilege of choosing their next oppressors in every election.